EXTRATERRESTRIAL: The Hills Have Aliens – Schlockmania! The horror in a backwoods horror film usually comes from two sources: (A) a psychotic killer or killers or (B) a monster. Extraterrestrial offers a potentially interesting variation on the form by replacing those usual threats with Close Encounters-style aliens. Unfortunately for the audience, that is where the film’s inventiveness ends, resulting a horror/sci-fi crossover that coasts on its mashup concept and never does too much with either half of its genre blend. 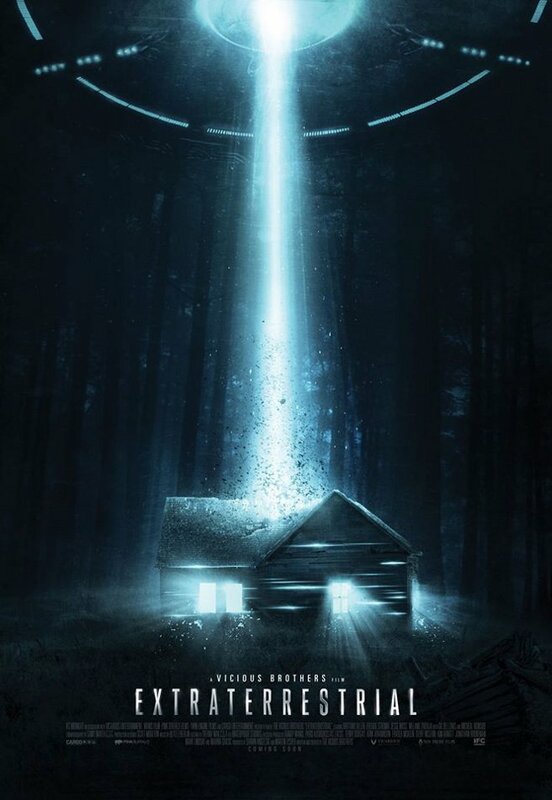 Like many a backwoods horror flick, Extraterrestrial begins with a secluded house in the woods. Nominal heroine April (Brittany Allen) goes out there at the behest of her divorcing parents to get some pictures of this second family home for a potential sale. She brings her longtime boyfriend Kyle (Freddie Stroma) – and he brings some of their mutual friends, including jerky jokester Seth (Jesse Moss) and April’s pal, Melanie (Melanie Papalia). They vacillate between partying and angsty college-student melodrama until aliens appear on the scene via a crashed U.F.O. April defends her pals with a shotgun and a game of cat-and-mouse between aliens and humans ensue. The setup is decent enough with Extraterrestial but the execution falters on multiple levels. The script by directors “The Vicious Brothers” is totally reliant on clichés and anything ambitious in the storyline, including a clever concept involving Area 51, is immediately forgotten after it is tossed out. After the obligatory first act setup, it settles into familiar horror concepts livened up with alien/UFO visual effects. Those effects are quite good for a modestly budgeted indie effort but it’s hard to get too excited about them because the human content of the storyline is a wash. The characterizations are the worst part of Exterrestrial, starting the audience off with a standoffish, easily annoyed heroine and making most of its backing ensemble either rural grotes ques or college party-comedy stereotypes. The second half of the film awkwardly shifts the tone to drama, asking us to care about the cartoonish protagonists as human beings – and it’s too much to ask because the setup of these characters doesn’t justify the effort. As for the performances, Allen and Stroma put in a decent effort but are defeated by their limp characterizations, particularly the self-defeating effort the story makes to present April as totally self-involved. The subsequent turns of the plot are supposed to teach her the error of her ways but she’s so alienating at the start that it’s hard to get involved in her plight. It’s also worth noting that Moss plays the most annoying jokester in recent horror history: you’ll want him dead within seconds of his introduction. Elsewhere, the protagonists’ ranks are fleshed out by war vet/pot farmer Travis (Michael Ironside) and local sheriff Murphy (Gil Bellows): both actors give greater effort than the story deserves and are ultimately let down by poor characterizations. It’s kind of embarrassing to see an actor of Ironside’s caliber reduced to playing a half-psycho, half-comic relief role. In short, Extraterrestial has a few promising concepts but squanders them with poor storytelling and tonal shifts violent enough to induce whiplash. It’s a shame because the quality of visual and the special effects suggests that they could have done something impressive if they’d worked as hard on their storytelling. Blu-Ray Notes: This film has been released by Scream Factory on blu-ray. The results do well by the film’s high-tech digital look, even offering a 7.1 lossless soundtrack with plenty of surround-sound effects. A small complement of extras are also included. A commentary pairs the Vicious Brothers with actors Brittany Allen and Melanie Papalia. It’s an informal track with plenty of joking around and production tales, including some nice complements for Michael Ironside. Elsewhere, seven minutes of deleted scenes are essentially disposable comedic or character beats. There is also a making-of piece that is essentially an 8 minute interview with the directors about the film. The extras are rounded out by a flashy theatrical trailer and some spots for other IFC releases, including The Babadook. Blu-RayBrittany AllenExtraterrestrialHorrorMichael IronsideSci-FiScience FictionScream FactoryThe Vicious BrothersU.F.O.